It’s no wonder that when I began to plan my first novel in 1994, I chose to have the murder take place along what Discovery channel is now calling the “Highway Thru Hell” in their new reality series. In my frequent trips up the highway that summer with my late husband, I picked out a spot where an 18-wheeler could go off the road and not be seen for days at a time. It also had to be a spot where an accident was not likely to happen. 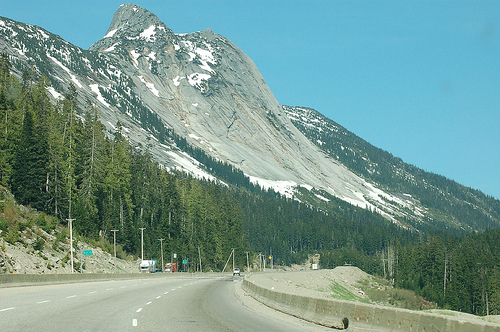 When I found a perfect spot, not very far south of Merritt, SLOW CURVE ON THE COQUIHALLA was born. In the intervening years, the layout along that stretch of highway has changed, but the highway itself remains dangerous and spectacular. I drove it again just last month, and like every time, I marvel at the magnificent snowshed and at the incredible rocky slopes of Zopkios peak. If you like to read, especially if you like to read mystery novels, check out the first novel in the Hunter Rayne highway mystery series. Hunter Rayne is a former homicide detective who has chosen to make long haul trucking his second career. He feels that the solitude of life on the road will help him to heal from two events that devastated his personal life before he resigned from the RCMP. His crusty dispatcher, Elspeth Watson, tries to keep Hunter and his navy blue Freightliner busy, and sometimes persuades him to get involved in murder investigations. For the month of October 2013, there is a promotion on the digital edition of Slow Curve on the Coquihalla to introduce the Highway Mysteries to new readers, so check your favorite ebook retailer to download a copy anywhere from $0.99 to free. Links to where you can purchase both digital and print editions of the Hunter Rayne highway mysteries are at Proud Horse Publishing, or ask your local bookstore or library to order it by giving them the ISBN 978-0-9881118-06. Tags: British Columbia, Coquihalla, criime novel, Highway Thru Hell, Hope, murder mystery, mystery, RCMP, truck driver, Zopkios | Permalink. I have had remarkable, adventurous trips on both the Canyon and the Coq. I much prefer the latter. Having the Hunter Rayne series with that setting just doubled my enjoyment. I look forward to the next issue in our intrepid trucks trials and tribs. I’ll always remember my final trip south away from the love of my life, my farm, my world. I got on the Coq at its northern tip and it was snowing like sixty, and when I got to the other end, the world was green and my windshield fogged with the new found warmth. For that moment, I allowed myself to believe I’d survive the end of one life and be able to start again. The Coq lives in my mind forever on that day, in that moment. It’s beauty surrounded me and kept me going. I, too, have many memories associated with travelling the Coquihalla. BTW, I’ve been reading Dying to Know and enjoying the BC settings. Will let you know when I’m finished (the trouble with ereaders is that it’s easy to have several books on the go at once!). Do you ever get back this way? Would love to sit down and chat some time.